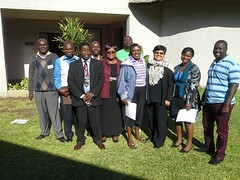 (Above photo) Zimbabwe Library Association National Executive Council (ZimLA NEC) posing for a photograph with ZimLA President L R Fusire (second from left) and LIASA President Ujala Satgoor recently. 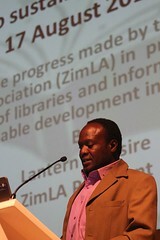 The Zimbabwe Library Association (ZimLA) President, Lantern Fusire would like to wish you all - library and information professionals in particular - a prosperous and ignited 2015. ZimLA in this coming year is looking forward to host a number of big events and workshops. We are also looking forward to host the 49th Conference in Kariba in June and the Call for papers is out already. We look forward to receive your abstracts through out this month of January and February. We also hope that you will renew your membership for 2015 to enjoy slashed conference fees and other opportunities we have lined up for our registered members. Membership details can be obtained from your branch Chairperson. Thank you.